Renal disease in cocaine and heroin users is associated with the nephrotic syndrome, acute glomerulonephritis, amyloidosis, interstitial nephritis, and rhabdomyolysis. The pathophysiologic basis of cocaine-related renal injury involves renal hemodynamic changes, glomerular matrix synthesis and degradation, and oxidative stress and induction of renal atherogenesis. Heroin is the most commonly abused opiate in the United States. Previous studies identified a spectrum of renal diseases in heroin users. The predominant renal lesion in black heroin users is focal segmental glomerulosclerosis and in white heroin users is membranoproliferative glomerulonephritis. Although the prevalence of heroin use in the United States has increased, the incidence of “heroin nephropathy” has declined. Because reports of heroin nephropathy predated the surveillance of hepatitis C virus and HIV, the varied findings might be related to the spectrum of viral illnesses that are encountered in injection drug users. Socioeconomic conditions, cultural and behavioral practices, or differences in genetic susceptibilities may be more associated with the development of nephropathy in heroin users than the drug’s pharmacologic properties. Administration of cocaine in animal models results in nonspecific glomerular, interstitial, and tubular cell lesions, but there is no animal model of heroin-associated renal disease. The heterogeneity of responses that are associated with heroin is not consistent with a single or simple notion of nephropathogenesis. There are no well-designed, prospective, epidemiologic studies to assess the incidence and the prevalence of renal disease in populations of opiate users and to establish the validity of a syndrome such as heroin nephropathy. It is concluded although there is a paucity of evidence to support a heroin-associated nephropathy, the evidence from in vitro cellular and animal studies to support the existence of cocaine-induced renal changes is more convincing. Substance abuse is common, involving lifetime exposure of 46% of the general population (1). Estimates for US lifetime and past-month prevalence of drug abuse among the general population aged 12 yr and older are 110 million and 19 million, respectively (2). The problem of drug abuse may be underestimated on questionnaires because of the sensitive nature of the illegal activity involved. Therefore, some respondents may be uncomfortable answering such questionnaires truthfully. Also, surveys do not account for institutionalized and homeless people, which include a significant high-risk population of substance abusers. Substances with the potential to be abused include alcohol, opiates, sedatives and hypnotics, cocaine, cannabis, hallucinogens and psychedelic drugs, psychotropic, stimulant and anxiolytic medications, and analgesics and amphetamines (3), which may have direct or indirect effects on physiologic mechanisms that lead to organ system dysfunction and disease. A multitude of renal diseases are associated with drug abuse because of the many different substances used with widely varying pharmacologic effects (3–10). Such drugs have been associated with several renal syndromes (3,4) by varied mechanisms. Causal associations between particular drugs and the development of a single renal disease, however, remain undetermined for the most part. Renal disease in cocaine and heroin abusers has been associated with the nephrotic syndrome, acute glomerulonephritis, amyloidosis, interstitial nephritis, and rhabdomyolysis. We pose the question, “Do cocaine and heroin nephropathies exist as specific entities, and, if so, what is the evidence to support or deny these claims?” We provide a critical review of the history, epidemiology, and pathophysiologic evidence supporting a causal relationship between cocaine and heroin abuse and chronic kidney disease (CKD). Cocaine has had a significant impact on many societies, cultures, and religions in the past 1200 yr. Shortly after its introduction to the United States in 1854, the nonmedicinal use of cocaine became predominant, eventually leading to abuse and dependence (11). Cocaine (benzoyl methylecgonine) is extracted from the leaves of the South American plant Erythorxylon coca (12). It exists in two major forms: Cocaine hydrochloride and alkaloidal freebase (crack) cocaine (Table 1) (12–15). Cocaine is well absorbed through mucous membranes, resulting in a slower onset of action, a later peak effect, and a longer duration of action when used orally or nasally compared with intravenous injection (12,16). Today, cocaine abuse and dependence is epidemic in the United States (Table 2). A total of 34.3 million Americans (14.6% of surveyed population) have used cocaine at some time, and 2.1 million Americans (0.9% of the surveyed population) used cocaine the month before the survey (Table 2) (17). In New York City between 1990 and 1992, cocaine metabolites were found in the blood and urine in 26.7% of people who sustained fatal injuries (18). More than 30% of deaths after cocaine use were attributed to drug intoxication; 65% involved traumatic injuries (19). A total 143,000 emergency department visits mentioned cocaine in 1994, and nearly 199,000 in 2002 (20). Except for cocaine-induced rhabdomyolysis (21–39), the direct effects of cocaine on the kidney have received less attention. The pathophysiologic basis of cocaine-related renal injury is multifactorial and involves changes in renal hemodynamics, changes in glomerular matrix synthesis, degradation and oxidative stress, and induction of renal atherogenesis (12,40). Cocaine has potent vasoconstrictive effects on vascular smooth muscle; however, the cellular mechanisms of action have not been elucidated (12,41–43). Cocaine inhibits catecholamine reuptake at the presynaptic nerve terminal, blocks norepinephrine reuptake in sympathetically innervated tissues, and releases norepinephrine and epinephrine from the adrenal medulla (12,44,45), resulting in development of hypertension and tachycardia (12). Cocaine may affect directly smooth muscle vascular cell calcium influx (12,46,47). Endothelins (ET) have been implicated in the vascular dysfunction that is induced by cocaine intoxication (12). There is a high density of ET-1 receptors in the vascular smooth muscle of all renal resistance vessels (48). Increased ET-1 production causes decreased renal blood flow and GFR (49). ET-1 is elevated in the plasma and urine of pregnant women with cocaine intoxication (12,50–52). Involvement of the renin-angiotensin-aldosterone system (RAAS) has been suggested because cocaine-induced ET release is inhibited by captopril and lisinopril in cultured human and bovine endothelial cells (50). Endothelial cells produce endogenous angiotensin-converting enzyme (ACE), suggesting that the effect of ACE inhibitors on BP and cardiovascular function may be due to local effects on endothelial cells (53). Captopril downregulates ET-1 release in cultured endothelial cells (54). Captopril in combination with diazepam increased survival time in rats that were exposed to lethal levels of cocaine (55). Ultimately, activation of the RAAS and angiotensin II by cocaine may lead to renal fibrosis from stimulation of TGF-β (12). The arterial pressor response involves the l-arginine–nitric oxide (NO) pathway (56). Rats that were pretreated with l-w-N-monomethylarginine, an NO synthase inhibitor, had an 80% reduction in pressor response to cocaine compared with controls (56). Collectively, the effects of cocaine on the kidney, through ET-1, the RAAS, and the l-arginine–NO pathway, result in vasoconstriction of the glomerular microcirculation. Cocaine has been linked to accelerated atherogenesis in both animal experiments and human studies and autopsy findings (57–70). Cocaine increases renal cellular oxidative stress and decreases intracellular glutathione in cocaine-exposed cultured renal epithelial cells (71). Cocaine increased thromboxane production and platelet aggregation in in vitro platelet cultures (72) and platelet activity, measured by platelet p-selectin expression, in human and canine models (73,74). Cocaine exposure increased collagen synthesis in rabbit aorta (61). Severe renal arteriosclerosis was noted in a 41-yr-old black man who did not have other risk factors and abused cocaine for 10 yr (65). Renal biopsy demonstrated mildly increased mesangial matrix without deposits, normal basement membranes, and mild interstitial fibrosis. Interlobular and segmental arteries showed severe narrowing as a result of marked intimal fibrosis. Cocaine has been associated with accelerated and malignant hypertension as well as implicated in hastening the progression of hypertensive nephrosclerosis to ESRD (75,76). Twelve black individuals who were identified as habitual cocaine users for up to 10 yr presented with severe hypertension, advanced renal insufficiency, non–nephrotic-range proteinuria, and decreased renal size. Information on serologic evaluation and confirmation of renal disease by renal biopsy was not given. Therefore, the presence of other nephropathies cannot be excluded (77–87). Chronic administration of cocaine to rats results in nonspecific glomerular, interstitial, and tubular cell lesions (88). Cocaine hydrochloride or saline was administered intraperitoneally to 28 experimental and 28 control rats for 90 d. No lesions were observed in controls, whereas a variety of lesions were found in cocaine-treated rats (Table 3). Chronic cocaine administration produced progressive changes in renal tubules and interstitium. Marked dilation of some tubules and necrosis of proximal and distal collecting tubular cells, with nuclear karyorrhexis, cytoplasmic eosinophilia, and vacuolization, were demonstrated. Renal lesions seen in the rat model were dissimilar to those found in human autopsies (64). Histologic features of 40 kidney autopsy specimens in patients with cocaine-related deaths were compared with 40 accident victims. The ratio of the number of sclerotic glomeruli to the total number of glomeruli was 18-fold greater in cocaine users than in controls. Highly significant differences also were found in the degree of periglomerular fibrosis, degree of interstitial cellular infiltrate, and hyperplastic arteriolosclerosis in cocaine users compared with controls. Medial thickening, luminal narrowing, and vessel obstruction were absent in the control group. A total of 75% of cases were found to have advanced coronary atherosclerosis, more extensive than expected in normal populations >60 yr of age. Currently, no epidemiologic data address cocaine-associated CKD in the United States. A case-control study was performed to examine recreational drug use as a risk factor for ESRD (89). Reported cocaine use was associated with a three-fold increased risk for developing ESRD. However, after adjustment for use of opiates, the relative risk for cocaine became insignificant. Differences in urban and rural communities and their unique set of cultural practices may modify the risk for developing CKD (90). A prospective cohort of 647 patients who were followed during a 15-yr period were assessed to associate a history of illicit drug use with renal functional decline (91). There was a three-fold, significantly increased risk for mild functional decline associated with cocaine or crack use compared with nonusers. The study could not determine whether illicit drug use preceded the decline in renal function. Cocaine use was reported in 28.5% of 193 dialysis patients (92). A history of cocaine use was associated with a diagnosis of hypertension-related ESRD in 89.1% of cocaine users versus 46.4% of nonusers. Cocaine users had significantly fewer years of hypertension than nonusers before developing ESRD (5.3 ± 5.4 versus 12.7 ± 9.8 yr; P < 0.0005). Illicit drug use, however, was not found to be a risk factor for severe hypertension in a black and Hispanic population (93). Despite the plausible putative effects of cocaine on the kidney and vasculature, medical noncompliance and socioeconomic factors may contribute to the increased risk for renal deterioration in hypertensive black individuals (94,95). Diagnoses of hypertension-related ESRD often are made on clinical grounds alone, so the validity of reported causes of ESRD may be uncertain without verification by renal biopsy (92). Nephrologists are more likely to make a clinical diagnosis of hypertensive nephrosclerosis as a cause of ESRD in black patients (96). Well-controlled, prospective, epidemiologic studies are needed to clarify the relationship between cocaine use and the development of CKD. Rare associations of cocaine and renal disease have been described in case reports of renal infarction after nasal insufflation of cocaine (97), a case of anti–glomerular basement membrane antibody–mediated glomerulonephritis (98), and acute interstitial nephritis induced by crack cocaine (99). Besides these uncommon associations, the pathophysiologic mechanisms of cocaine-induced CKD largely remain unknown. Heroin is processed from morphine, a naturally occurring substance that is extracted from various poppy plant species. Heroin can be injected, inhaled, or smoked for its euphoric effects. The purity of heroin depends on whether the heroin is “cut” with other drugs or substances, known as adulterants. Common adulterants include sucrose, dextrose, mannitol, lactose, starches, powdered milk, quinine, caffeine, inositol, lidocaine, procaine, acetylprocaine, methapyrilene, and strychnine (100). The Drug Enforcement Administration analyzed 12,366 heroin/cocaine samples and found a frequency of adulterants exceeding 5% (101). Heroin is the most commonly abused opiate in the United States (102), accounting for a lifetime prevalence of 1.6% among Americans 12 yr and older (17) (Table 2). From 1992 through 2002, the annual number of new heroin users ranged from 96,000 to 122,000 (103). During this period, approximately 75% of new users were 18 yr and older, and 63% were male (103). There is little difference in the proportion of heroin users among various racial or ethnic groups (17) (Table 2). Heroin abuse has become a growing health-related problem in large metropolitan areas. In June 2003, 62 to 82% of all emergency admissions that were associated with illicit drug use (except alcohol) were related to the use of heroin in Baltimore, Boston, and Newark (104). Forty heroin- or morphine-related emergency encounters per 100,000 residents were projected in 2000 (105). In comparison, there were 70.7 cocaine-related and almost 40 marijuana-related emergency encounters per 100,000 residents (105). Total emergency encounters for heroin/morphine increased from 63,158 in 1994 to 94,804 in 2000 (105,106). McGinn et al. (107) first described the presence of renal disease associated with the use of heroin in the 1970s. Three heroin addicts and one cocaine addict who were aged 17 to 22 yr and had nephrotic syndrome were described. Initially, all patients had renal biopsies without lesions on light microscopy. Three patients were followed for 3 mo and demonstrated stable or progressive proteinuria despite trials of prednisone, azathioprine, or both drugs in combination. A second biopsy in one patient revealed membranous glomerulonephritis. Focal membranoproliferative glomerulonephritis with IgM and complement deposition was found in seven of eight heroin addicts with the nephrotic syndrome (108). Four men and two women, aged 23 to 40 yr, presented with a chief complaint of edema. Patients had azotemia, nephrotic-range proteinuria, and hematuria. Four patients had hypocomplementemia, and four had polyclonal gammopathy. Basement membrane thickening with electron-dense deposits as well as amorphous electron-opaque material in the subendothelial space were found. Amyloid fibrils were absent. Focal and segmental glomerulosclerosis (FSGS) was a common glomerular lesion in heroin users who underwent biopsies in other case series (109–112). FSGS, with a paucity of focal proliferative changes, was found in 11 of 13 heroin users who underwent biopsies (109). All patients were black men, aged 19 to 34 yr, who admitted to injecting heroin for 1 to 18 yr before the onset of renal disease. Three patients had a recent history of icteric hepatitis, and three patients had elevated ASO titers. Immunofluorescence studies detected a consistent pattern of focal and segmental glomerular IgM and C3 deposits. Contrary to finding FSGS in some renal biopsy series, other investigators noted a high prevalence of sclerosing glomerulonephritis (113,114). Twenty-three black men with a history of a few months to 15 yr of heroin use presented with hypertension and varying degrees of renal insufficiency, proteinuria, and urinary abnormalities. Varying degrees of glomerulosclerosis were present on light microscopy. Fine basement membrane linear deposition of IgG and focal granular IgM and C3 deposits were demonstrated in 16 of 21 biopsies performed. Global, segmental, or mesangial sclerosis; glomerular basement membrane thickening; and epithelial cell foot process dropout also were demonstrated. The authors compared renal biopsies that were performed in drug abusers and non–drug abusers with glomerulosclerosis and found no renal pathologic markers that differentiated the two groups. Llach et al. (115) found no specific histologic or immunofluorescent pattern in patients who had renal disease and used heroin. A spectrum of pathologic findings including FSGS, minimal-change disease, mesangial proliferation, membranoproliferative glomerulonephritis, dysproteinemias, and diabetic nephropathy was found by Grisham, Churg, and Porush in heroin users with renal disease (116). A case of granulomatous interstitial nephritis also was reported in a heroin user (117). Focal and diffuse segmental and global glomerulosclerosis also was demonstrated in patients who used intravenous pentazocine or tripelennamine. The investigators concluded that renal findings that were associated with heroin use were nonspecific (118). Renal biopsies in 19 white heroin users also demonstrated a spectrum of pathologic findings, including 13 patients with membranoproliferative glomerulonephritis (MPGN), two with chronic interstitial nephritis, two with acute proliferative glomerulonephritis, one with amyloidosis, and one with granulomatous glomerulonephritis and interstitial nephritis (119). All patients had serologic evidence of hepatitis C virus (HCV) infection, one had hepatitis B surface antigenemia, and three had HIV infection. The authors concluded that nephropathy in this group of white heroin addicts was frequently associated with HCV-associated MPGN rather than the FSGS previously reported in black individuals. Dettmeyer et al. (120) reported similar findings from 179 autopsies of white heroin addicts. Lynn et al. (121) described renal biopsies of five intravenous opiate abusers who had large amounts of vacuolated material deposited within the mesangium and within endothelial and epithelial cells. The one commonality that was shared among these patients was the intravenous use of opiates mixed with lemon juice or acetic anhydride and sodium bicarbonate as vehicle. Some authors have speculated that the drug vehicle or adulterants in drugs may be the cause of kidney injury, rather than the opiate itself (100,113,122). 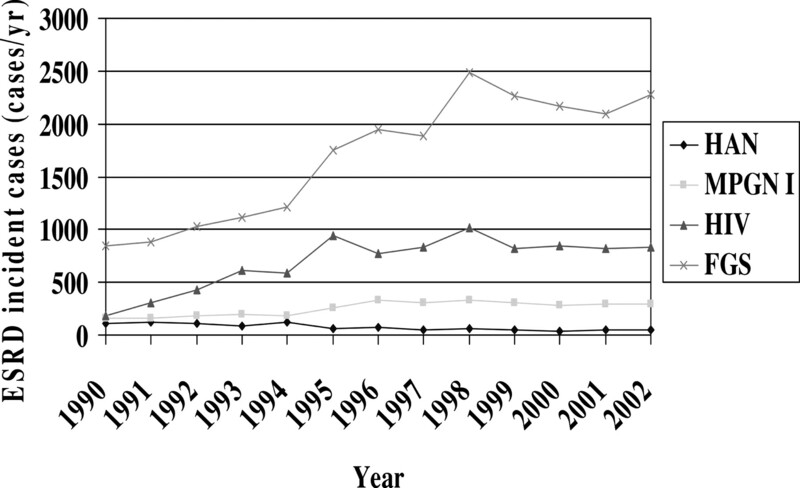 Friedman and Rao (122) studied the declining incidence of heroin-associated nephropathy at Kings County Hospital in Brooklyn, NY, from 1983 to 1993. There were no cases reported from 1991 through 1993, despite a rise in opioid-related hospital admissions. Cases were defined histologically by FSGS and mesangial deposition of IgG, IgM, and C3, with varying degrees of tubular injury. The authors speculated that the increased purity of street heroin from 6.9 to 8% in 1980 to 1981 to 61% in 1992 and the concomitant decline in accompanying adulterants may have been responsible for the reduction in the incidence of heroin nephropathy. They suggested that the presence of concomitant infectious processes, such as HIV infection in heroin users, may have contributed to the development of renal injury. Infective endocarditis, HIV, and HBV and HBC infections are associated with renal pathologic patterns similar to those previously described in heroin users (123–137). Because reports of heroin-associated nephropathy predated the surveillance of HCV and HIV infection with serologic and virologic tools, it is conceivable that some of the various histologic findings might have been related to the spectrum of viral illnesses that are encountered in injection drug users (3). Transmission of HIV, HBV, and HCV among injection drug users is common. In several cohorts, seroprevalence rates for HCV, HBV, and HIV were 85, 77 to 84, and 24 to 28%, respectively (138–141). A high prevalence of HIV, HCV, and HBV infections among intravenous drug abusers therefore may limit the ability to discriminate putative infectious from heroin-related renal disease. Similarly, the increasing incidence of injection drug use has had an impact on the overall incidence of infectious endocarditis (135,136). An increased frequency of HLA-B53 was found in 47 black patients with presumed heroin-associated nephropathy (142). Rather than a genetic susceptibility of heroin users to developing nephropathy, several authors have suggested that there is a genetic link predisposing black individuals to developing FSGS (79–84,142–144). Idiopathic FSGS has become the leading cause of nephrotic syndrome in black individuals, as well as a common cause of renal disease in white individuals in the United States (79). However, black individuals are four times more likely to develop FSGS than are white individuals (79,80). Recently, several investigators identified gene mutations that are associated with the development of sporadic FSGS. Single-nucleotide polymorphisms of the Wilms’ tumor gene (WT1) and an upstream gene, WIT1, were found to be associated with idiopathic FSGS (84). Mutations in the WT1 gene are responsible for Frasier and Denys Drash syndromes, two childhood diseases that are characterized by FSGS (145–147). Genetic mutations in podocyte-associated proteins such as α-actinin-4, podocin, and β-integrin also have been implicated in the development of FSGS (148–150). Although the prevalence of heroin abuse in the United States has increased, the incidence of “heroin nephropathy” has declined. Since the rise in heroin abuse in the United States, there also has been an increased incidence of HIV and HCV infection and their associated renal diseases (126,151,152) (Figure 1). There has been a consistent decline in the number of reported cases of heroin nephropathy since 1992, and the incidence of ESRD has increased 53.6% from 306,000 from 1991 to 1995 to 470,000 from 1998 to 2002 (153,154). Although there are small differences in the racial/ethnic distribution of heroin users in the United States (Table 2), the overwhelming preponderance of heroin nephropathy cases is in black men. From 1998 to 2002, 59.2% of patients with heroin nephropathy were black and 37.6% were white (153). Heroin nephropathy also is more common in male individuals, comprising 75.5% of all cases reported (153). Incident cases of ESRD secondary to heroin-associated nephropathy, membranoproliferative glomerulonephritis type 1, HIV infection, and focal segmental glomerulosclerosis. HAN, heroin-associated nephropathy; MPGN, membranoproliferative glomerulonephritis; FGS, focal segmental glomerulosclerosis. Data from Dr. Paul Eggers, US Renal Data Systems, personal communication (February 4, 2005). Case series suggest a low prevalence of renal disease in heroin users (155,156). Only three of 145 asymptomatic male heroin users who were admitted to a methadone detoxification program had daily urinary protein excretion >150 mg (155). One patient was found to have membranous glomerulonephritis, and all but one patient had normal renal function (155). Although there was a three-fold increased relative risk for mild renal functional decline in heroin users versus non–drug users among 647 hypertensive men, the difference was NS in multivariate analyses (91). A strong association between opiate use and ESRD among subgroups defined by gender, race, or demographic differences was demonstrated (89). However, causal links between opiate use and ESRD could not be determined (89). We could find no other studies of the incidence of proteinuria or renal dysfunction in addiction or methadone clinics to establish valid epidemiologic data on the association of opiate use and renal disease. It may be that socioeconomic conditions, cultural and behavioral practices, or differences in genetic susceptibilities to developing nephropathy are more associated with the development of nephropathy in heroin users than the pharmacologic properties of the drug (90,144). Currently, there is no in vivo animal model of heroin nephropathy; however, there is a growing body of literature to support in vitro changes in renal cells that are exposed to morphine. Although few direct effects of heroin on renal structure and function have been reported, recent studies suggest that morphine has direct effects on mesangial and glomerular epithelial cells (GEC), kidney fibroblasts, and the interaction of mesangial cells with circulating and resident macrophages. Heroin cannot be metabolized to its active metabolite, morphine, in most renal cell cultures. Therefore, morphine was used instead of heroin in most in vitro studies. The classic lesion of FSGS starts with mesangial cell hyperplasia and GEC hypertrophy (157). Nevertheless, in the course of either classic or variant forms of FSGS, there is eventual loss of mesangial epithelial cells and GEC (158–162). Loss of GEC or apoptosis has been suggested as an underlying mechanism in the development of FSGS (163–167). Glomerulosclerosis is thought to result from mesangial cell expansion, increased matrix deposition, and secretory factors that are modulated by macrophages (168–178). Mesangial expansion can occur either by mesangial cell proliferation or enhanced deposition of extracellular matrix or both. Matrix-degrading metalloproteinases are regulated by tissue inhibitors of metalloproteinases (179,180). Morphine amplifies cocaine-induced renal cortical messenger RNA expression of tissue inhibitors of metalloproteinase-2 (181), resulting in matrix accumulation. Macrophages have been implicated in the pathogenesis of FSGS (182,183). Morphine induces both inhibitory and proliferative effects on fibroblasts, mesangial cells, and macrophage activity (184–189). At lower concentrations, morphine predominantly stimulates mesangial cell and fibroblast proliferation, mesangial matrix deposition, and macrophage activity. At higher concentrations, morphine inhibits mesangial cell and fibroblast proliferation, mesangial matrix deposition, and macrophage activity (185–189). Morphine has a bimodal effect on GEC (190). At lower concentrations, morphine promotes GEC growth, whereas at higher concentrations, morphine triggers GEC apoptosis. Moreover, antioxidants and free-radical scavengers prevent morphine-induced GEC growth as well as apoptosis, suggesting that morphine’s effects may be mediated through oxidative stress. Morphine stimulates the production of superoxide by macrophages and mesangial cells (187,191), as well as the activity of macrophage heme oxygenase (192), an oxidative stress marker (193). Morphine exerts a bimodal effect on heme oxygenase activity in GEC as well (192), stimulatory at lower and suppressive at higher concentrations. AA (or secondary) amyloidosis has been described as an important cause of nephropathy among heroin users (194–208). The incidence of biopsy-proven renal amyloidosis among drug abusers with systemic amyloidosis and proteinuria varied between 25 and 67% in several series (197–199), whereas autopsies that were performed on 150 drug addicts showed an incidence of renal amyloidosis of approximately 5% (200). Menchel et al. (200) surveyed 150 heroin users and reported that six of the seven addicts with renal amyloidosis also had extensive skin infections from subcutaneous administration of heroin (“skin popping”). In 23 patients with skin infections, 26% had renal amyloidosis. Subcutaneous heroin administration and resultant chronic suppurative infections were presumed to be pathogenically responsible (198). The average duration of heroin abuse was 15.8 yr. This is in contrast to an average of 6.3 yr in 40 intravenous heroin users with FSGS in a different series (198). Heroin abusers primarily were black men. At the time, 38% of heroin abusers in New York State were black (198). Crowley et al. (195) speculated that cessation of skin popping and treatment of chronic indolent skin infections may have led to stabilization of renal function in a heroin user who developed renal amyloidosis. Although amyloidosis still was present on a subsequent renal biopsy 6 yr after the diagnosis of disease, proteinuria decreased from 6.8 g to 170 mg/d, and creatinine clearance remained unchanged. Furthermore, the route of heroin administration, the presence of suppurative skin infections, and a longer duration of heroin exposure may be associated with a chronic inflammatory state that is necessary for the pathogenesis of renal amyloidosis. It still is unclear whether cessation of skin popping can lead to its resolution. Renal disease is seen frequently in drug users. It is interesting that cases of “heroin nephropathy” are few in number and have continued to decrease over the years, despite the increased prevalence of heroin use. Heroin nephropathy has been linked to a single diagnosis, FSGS, by some groups (110–112,122). The literature, however, suggests that no uniform histologic presentation of renal disease is associated with heroin use (107,108,113–116,119,120). Historically, many renal diseases have been associated with heroin use, with FSGS being the most predominant in black individuals and MPGN being the most predominant in white individuals. It is uncertain whether drug use is causal in the development of renal disease or whether nephropathy is more related to demographic, socioeconomic, or genetic factors of individual users (3,90,132,144,209). It is unclear whether FSGS in heroin users is a consequence of the habit or rather in fact represents the occurrence of a type of nephropathy that is present or overrepresented in populations of drug users in the United States (79), in effect “a true, true and unrelated” condition (3,132). The incidence of FSGS has increased in the last 20 yr and now is considered the most common cause of glomerular disease that leads to ESRD in the United States (79). Genetic factors may play a role in the development of FSGS (79–86). Recent studies suggest that black individuals with idiopathic FSGS may have a genetic predisposition to developing renal disease (79,81,83–85,144,209). It therefore is plausible that black heroin users with FSGS have a genetic susceptibility to the development of renal disease, unrelated to the drug use. The wide spectrum of renal pathology that is found among heroin users has raised controversy regarding whether there is a causal relationship between heroin use and renal disease (100,122). The heterogeneity of responses that are associated with heroin use is not consistent with a single or simple notion of nephropathogenesis (132). Unfortunately, investigators have focused largely on descriptive studies (132). Common co-infections with HIV, HCV, HBV, and endocarditis in intravenous drug users may manifest similar histologic presentations as those described in patients who had unrelated renal disease and used heroin (123–137). Because reports of “heroin nephropathy” occurred before the identification of HCV and the dissemination of virologic, serologic, and molecular biologic diagnostic tools, it is conceivable that some of the variation in the histologic findings might have been related to the spectrum of viral illnesses that are encountered in injection drug users (3). Few studies delineate pathogenesis of a presumed heroin nephropathy or detail extensive evaluation of viral infections and host responses in patients with presumed disease (3,132). Differences in the purity of heroin and the concurrent use of various adulterants make it difficult to distinguish the effects of repeated heroin exposure from the idiosyncratic effects that accompanying contaminants may have on the kidney. Furthermore, it may be difficult to verify a history of single-drug use in patients who may not have a close relationship with their physicians (3,100,122). Therefore, in humans, it is impossible to separate the effects of contaminants or concomitant drugs on development of renal injury. In in vitro cell cultures, there is a bimodal effect of morphine on mesangial epithelial cells, GEC and fibroblast proliferation; mesangial matrix deposition; and macrophage activity, depending on the concentration and temporal relationship of morphine exposure (184–189). Clearly, there has been neither a standardized concentration nor an agreed-on temporal exposure of morphine used in vitro that unequivocally simulates the physiologic state of the morphine/heroin addict. Moreover, there has been no in vivo animal model of heroin nephropathy to date. Furthermore, there is a paucity of evidence to support that morphine’s effects on renal cells in in vitro cell cultures are associated with the development of clinical renal disease in in vivo animal models. Finally, no well-designed, prospective, epidemiologic studies have assessed the incidence and prevalence of renal disease, including urinary abnormalities, in large, well-established populations of opiate users, to establish the validity of a syndrome such as “heroin nephropathy.” Previous studies have inherent biases as case series and are subject to selection biases according to criteria outlined by investigators. We conclude that although there is a paucity of evidence to support a heroin-associated nephropathy, the evidence from in vitro cellular and animal studies to support the existence of cocaine-induced renal changes is more convincing. However, clinical evidence of the association between cocaine and CKD also is sparse. In the future, well-designed, epidemiologic studies may help to elucidate the association between cocaine and renal disease.